SREMSKI KARLOVCI, Serbia, Nov. 1 (Xinhua) -- A Confucius classroom opened on Thursday in the Serbian city of Sremski Karlovci, on the occasion of the anniversary of the country's oldest secondary school. With that, pupils will now be able to learn the Chinese language, apart from classical and modern languages. A ceremony of the 227th anniversary of the establishment of the Gymnasium of Karlovci (Karlovci Grammar School) was held at Sremski Karlovci, a town some 60 kilometers north of the capital Belgrade. Among attendees were Mladen Sarcevic, Serbian minister of Education, Science and Technological Development, Prime Minister of Serbia's autonomous province of Vojvodina Igor Mirovic, Yuan Jigang, with the Chinese embassy in Serbia, as well as current and former students and professors of the school. "Thanks to the generous support of the Embassy of China and the Confucius institute at the University of Novi Sad, today we opened and put in disposal completely-equipped, modern schoolrooms for Chinese language learning," said director of the school Radovan Kovacevic in his welcome speech. Minister Sarcevic congratulated on the anniversary and good results of the school throughout centuries, as well as Chinese Embassy and China with whom Serbia has excellent cooperation. Provincial PM Mirovic wished the school success in multi-language learning, and expressed hope that Sremski Karlovci might in the near future grow into a university center. High school pupils recited sayings of Confucius dressed in his costume, while the choir sang a popular Chinese song "Friends". Yuan expressed gratitude to Serbia as well as its educational institutions for supporting Chinese language learning. "Chinese language learning is in increase, which opens new possibilities and better perspective for all students that learn Chinese language," he said. "The number of schools in China that offer students to learn Serbian language is also increasing, as well as the number of students. The traditional friendship between our countries must become wider, and should be passed on to future generations," he said. 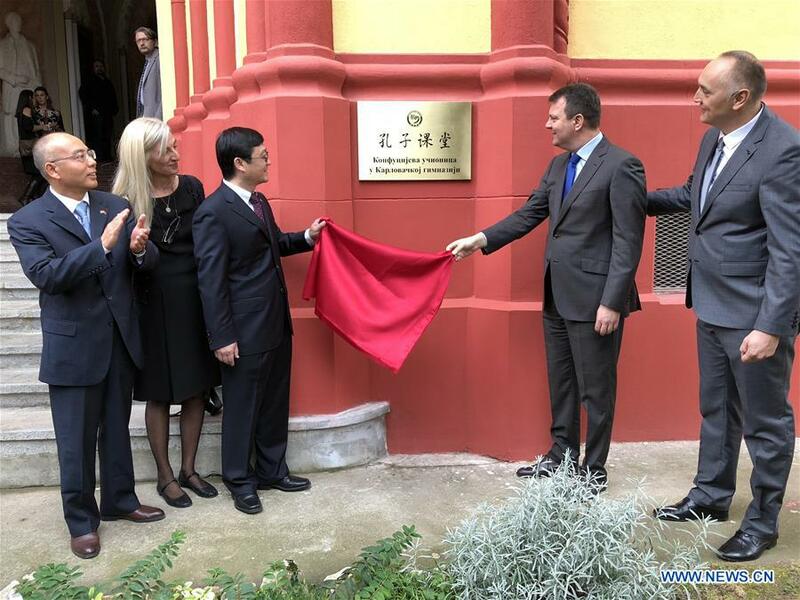 This is the second Confucius classroom opened in Serbia, along with the existing one in the capital city of Belgrade. Moreover, the country hosts two Confucius institutes -- one at the University of Belgrade, and the other at the University of Novi Sad. The Gymnasium of Karlovci opened in 1791 with Latin as the teaching language then, as in most schools of the Holy Roman Empire of the time. The school continued to exist throughout centuries, and today it is specialized for philology, and has two departments -- one for classical, and the other for modern languages.